Innovation has been at the center of America’s economic competitiveness for decades. In the energy sector, federal research and development (R&D) programs have served as a foundation on which the private sector has built an impressive track record of innovation, creating jobs, lowering costs and enhancing energy security. The Advanced Research Projects Agency for Energy (ARPA-E) was created to ensure the United States maintains a competitive edge in developing emerging energy technologies. ARPA-E has already demonstrated a great deal of early success. Since it was first funded in 2009, 136 of over 340 completed projects supported by ARPA-E have attracted over $2.6 billion in private sector follow-on funding, published 1,634 peer-reviewed journal articles, been issued 248 patents, and 71 have formed new companies. The American Energy Innovation Council, among others, has argued since 2010 that ARPA-E’s unique approach sets it apart from the rest of the national energy R&D enterprise. ARPA-E was modeled after the successful Defense Advanced Research Projects Agency (DARPA), which itself was created in 1958 as a response to the Soviet Union’s launch of the world’s first satellite. DARPA went on to develop GPS and the internet. In 2007, the National Academy of Sciences published its Rising Above the Gathering Storm report, which found that the United States was again at risk of falling behind other nations in science and technology. One of its key recommendations was to create an organization like DARPA in the Department of Energy to overcome the high-risk technological barriers to the development of advanced energy technologies. In 2007, President Bush signed the AMERICA COMPETES Act into law, establishing ARPA-E and setting a goal of doubling investments in core science agencies. America’s success in these markets will depend on whether we empower it, or allow continued uncertainty to undermine it. ARPA-E has focused on identifying off-roadmap research that isn’t being pursued anywhere else. Like DARPA, ARPA-E recruits top talent from across the energy space to identify and utilize unique approaches to solve difficult problems. These program directors utilize a workshop process to refine the scope of the programs they pursue. Like a “shark tank” for identifying important research, program directors have to convince not just the agency, but also a multi-disciplinary team of scientists that they’ve identified a problem worth solving. Once they’ve settled on a program, they fund a portfolio of projects, increasing the chance of success by creating more shots on goal instead of focusing on a predetermined set of technologies that may not end up working. Empowering program directors in this way—while requiring them to demonstrate that a topic is worth exploring—ensures that instead of a top-down, centrally planned research program, ARPA-E has the flexibility to pursue research targets of opportunity that would be more difficult under traditional institutional arrangements. This approach has been key to ARPA-E’s early success. ARPA-E focuses on projects that are too early in their development to attract private sector funding. As the recent National Academy of Sciences Assessment on ARPA-E found, ARPA-E is funding projects that no one else is funding. This isn’t surprising, given the early stage and high-risk nature of the projects they’re pursuing. ARPA-E has also demonstrated an ability to accelerate the development of early stage projects. A Government Accountability Office report found that most ARPA-E funded projects were either at or before proof of concept stages. 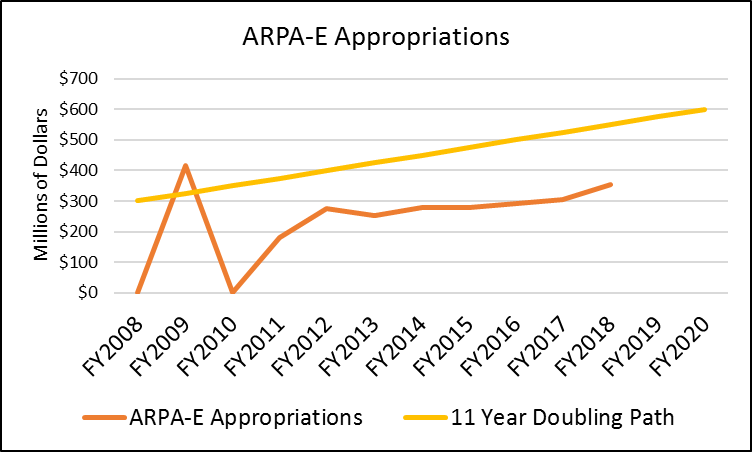 Without ARPA-E’s support, they would have either terminated their projects, or taken at least a decade to commercialize them. ARPA-E’s management toolkit includes the use of techno-economic analysis, which helps innovators identify and anticipate commercialization challenges such as market shifts or manufacturing bottlenecks that could derail their work. Identifying these challenges early in a technology’s development helps to avoid the “valley of death”—delays or cost overruns that might otherwise cause a project to fail. This metric-driven process also means that when projects are underperforming and need to be terminated, these decisions can be made with confidence, ensuring responsible stewardship of taxpayer dollars. Eliminating ARPA-E would have damaging long-term consequences. Even if funding levels are maintained, ongoing questions about the agency’s future will undermine its success. With stable support, ARPA-E will be able to continue attracting top talent and maintain its flexible approach to funding transformative, off-roadmap research. To provide that certainty, policymakers should appropriate funding more commensurate with its potential impact and reauthorize ARPA-E long term. To bolster U.S. technology leadership, Congress set a goal of doubling science funding, including through ARPA-E, by 2020 when it reauthorized the AMERICA COMPETES Act in 2010. Congress reaffirmed this commitment when it passed the American Innovation and Competitiveness Act (AICA) in 2017. We are far short of this goal and risk falling behind as other nations step up their research investments to compete in emerging billion-dollar technology markets. ARPA-E’s unique approach fills an important gap in the energy technology development cycle. America’s success in these markets will depend on whether we empower it, or allow continued uncertainty to undermine it. This entry was posted in not-featured and tagged ARPA-E, DEPARTMENT OF ENERGY. Bookmark the permalink.